In 1838, the Rev. Simeon W. Harkey became pastor in Frederick and took charge of the “schoolhouse appointments”. Having a revivalist inclination, Rev. Harkey motivated the Bethel congregation to erect a church building. They broke ground for it in the Spring of 1838 and dedicated Bethel’s first church building in November of that year. The structure served as a union church for more than forty years, home to both Lutheran and German Reformed congregations. Rev. Harkey, assisted by the Rev. Michael Wachter, served the Lutherans of Bethel until 1850. Bethel’s union church period ended in 1881 when a move was made to rebuild the old church. However, a majority of the Reformed members, desiring their own church, withdrew under the leadership of their pastor, Rev. Silas M. Hench, to a site in nearby Charlesville, where they built a new church and cemetery. 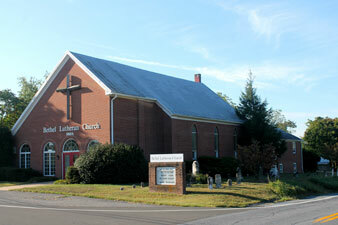 This church was first known as Zion Reformed Church, now known as Faith United Church of Christ. Over time, improvements were made to the church at Bethel and today, it continues to serve its Lutheran congregation as well as the local community.